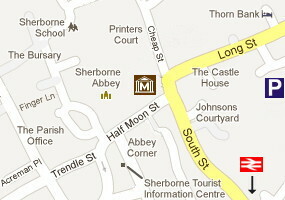 Sherborne Museum is located in a prime central position halfway along Church Lane in close proximity to the Abbey and also to the Conduit at the bottom of Cheap Street, the main commercial road in town where you will find shops, cafés, pubs and restaurants. We are within walking distance of the Almshouse and the two Castles - so the Museum can provide the basis for a great day out. The main door to the Museum is 33 inches wide. Wheelchair access, however, is limited to the ground floor; unfortunately we are unable to provide a stair lift due to our status as a listed building. There is a touch-screen available on the ground floor for digital access to our photographic archives and images of examples from our collections. A Sensory Trail is being developed to enhance the visits of all those who might benefit from tactile, sensorimotor and proprioceptive experience. Support dogs of all kinds are welcomed. Out of hours visits and personal tours can be arranged by appointment to accommodate all needs. There is a WC for the disabled. The station is in Station Road just off South Street about 7 minutes walk from the Museum. SW Trains operate a regular hourly service taking 2 hrs 15 mins from London Waterloo to Sherborne. Trains from Exeter and other parts of the SW are also regular. Buses stop at the top of Digby Road by the Tourist Information Centre 4 minutes walk away from the Museum and also at Greenhill at the top of Cheap Street. The National Cycle Route 26 runs from Yeovil to Sherborne. Our exact location is Lat: 50.946742, Long: -2.515694. If you're visiting the area, why not try these one of these businesses that support us?